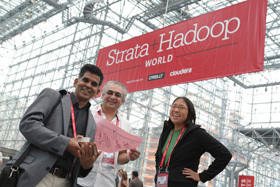 In 2014, O'Reilly and Cloudera joined forces to merge Hadoop World with Strata Conference. 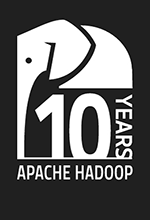 This series of premier data events around the world is led by Apache Hadoop founder Doug Cutting of Cloudera, O'Reilly's Roger Magoulas, and entrepreneur and author Alistair Croll. Our speakers have a laser-sharp focus on the data issues shaping all aspects of business, including verticals such as finance, media, retail and transportation, and government. 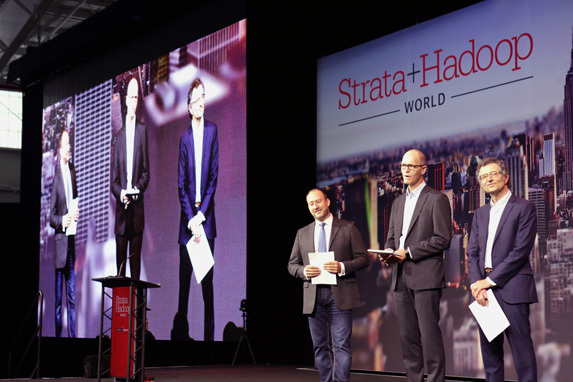 The data industry is growing fast, and Strata + Hadoop World has grown right along with it. We've added new sessions and tracks to reflect challenges that have emerged in the data field—including security, ubiquitous computing, collaboration, reproducibility, new interfaces, emerging architecture, building data teams, machine data—and much more. Strata + Hadoop World is now the largest conference of its kind in the world, yet it’s kept the informal, collegial spirit that makes it one of the best places to connect and collaborate. Strata + Hadoop World is where big data's most influential business decision makers, strategists, architects, developers, and analysts gather to shape the future of their businesses and technologies. If you want to tap into the opportunity that big data presents, you want to be there. You'll get three full days of inspiring keynotes, intensely practical and information-rich sessions, and plenty of fun networking events. "An excellent event focused on the intersection between distributed computing and data science." "The conference gave me access to leading thinkers in big data and businesses with big data problems. I enjoyed the tutorials and talks, and look forward to experimenting with some of them in the next few months." "The event was invigorating from a community perspective. Big Data gets so much hype that being with real practitioners felt awesome. It was also nice to see the spectrum of professionals in the space--data scientists, software guys, business users, tool developers, etc. all in one location—sharing knowledge was awesome." "The event speakers, content, and organization were exceptional. This is probably the pinnacle of Big Data conferences to attend for networking and getting the latest updates on ground breaking new technologies in the Big Data space. I will definitely attend this event next year." is the chief data scientist at O'Reilly Media, Inc. He has applied business intelligence, data mining, machine learning and statistical analysis in a variety of settings including direct marketing, consumer and market research, targeted advertising, text mining, and financial engineering. His background includes stints with an investment management company, internet startups, and financial services.